The ultimate luxury in air travel. Even the most seasoned traveler gets homesick, but Winch Design is offering to help frequent fliers feel more at home at cruising altitude. Business travelers often end up spending days to weeks worth of time in the air, so feeling comfortable is essential. Anything approximating ‘at-home’, however, has been only an in-air fantasy for most. But jet owners can now turn to Winch Design to help recreate the feeling of home while traveling in their private jet. Years of experience making customers’ bespoke jet dreams come true yielded the necessary experience, but a recent project provided the inspiration for the style: Winch Design oversaw the interior styling for a customer’s ACJ319 interior. 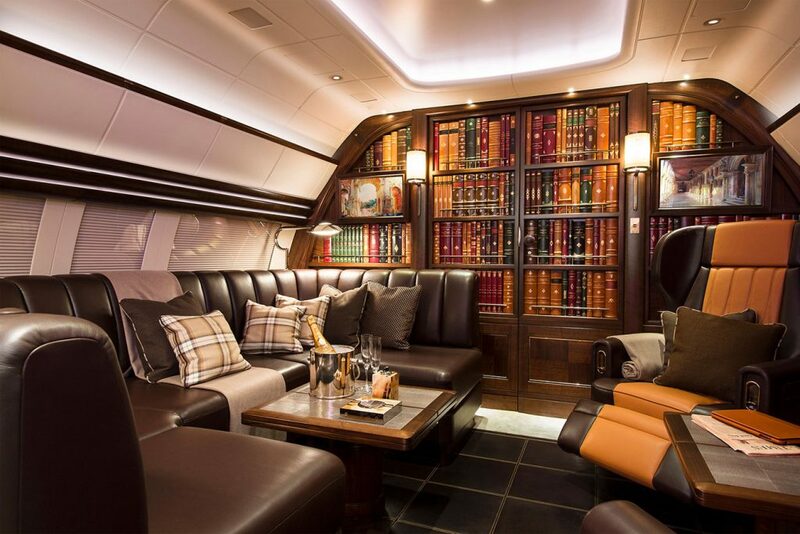 Even though airplane interiors are notoriously difficult to personalize due to aviation regulations and weight restrictions, the company was able to create a high-end classic look that’s truly reminiscent of home. Luxe materials like saddle-hide, leather, and hand-carved mother-of-pearl take this private jet to the next level. The standout space is certainly the lounge, which is decorated with a plush leather sectional, a reclining leather armchair, and double doors disguised as a classic dark bookshelf filled with leather-bound tomes. In essence, the company created a space that’s not only functional but also exudes its own aura of peace and tranquility. This design marvel is currently available to purchase from Sparfell & Partners.